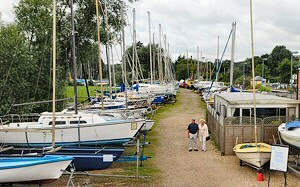 A friendly but professional, family run business with an old fashioned approach to sales & customer service, situated on the waterfront of the delightful market town and boating centre of Woodbridge in Suffolk. Andy arrived in Woodbridge from the Midlands in the early 70’s to join his parents who had moved there some years before. Boating had always been the family hobby and he soon realised that whilst you could order your yacht from one of the local yards, there was nowhere to buy a dinghy to hang on the davits! He soon set about "plugging the gap" and acquired a premises on the Quayside and began buying and selling tenders, small fishing boats, sailing dinghies & day boats. The Quayside Office – the nerve centre of the business. His intention was to bring boating to "everyman" and his early adverts boasted that he could "get you sailing or motoring down the river for less than £500". Several thousand boat sales later it seems he was right! The business went from strength to strength and the range and size of boats he offered grew dramatically and now he has over 70 boats on display at any time, from dinghies to ocean going yachts – canoes to 40’ cruisers. Andy, still with economy in mind, says that he can always find his clients a bargain if they don’t mind doing a bit of maintenance and "tidying" themselves. He also felt the same principle should apply to boating equipment and he began to build up an extraordinary collection of used chandlery, fittings and "boaty bits" in his "Aladdin’s cave" shop. 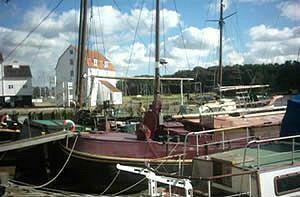 He is able to kit out his boat buyers & local owners at a fraction of the cost of them buying new. From life jackets for the kids to anchors, ropes, electronic equipment – the list is endless. The word soon spread and now his clients come from far and wide to buy fittings and equipment for their boats which perhaps are unobtainable elsewhere. Roadside display area with smaller craft of all types. Andy’s son James joined the business in 1996 and now plays a major part in its running. Also, Andy’s wife Lorna has always helped him, doing the bookwork, answering the phone and, as Andy says, keeping him and James out of The Anchor pub over the road! Truly a family run business. 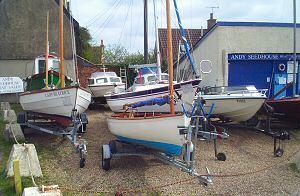 "Aladdin’s Cave" of used chandlery, engines and much more. Have a look under "Boats for Sale" and find yourself a bargain or if you have one to sell look under "Sell your Boat" and see what back up is given under "Services" or contact him on the links at the top of the page. 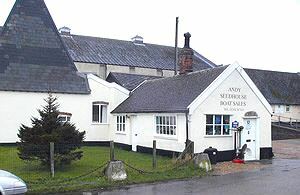 Better still, why not call at his yard and have a browse round, all the boats have a full description and price attached to them so you can look in peace anytime – the yards has 24 hour pedestrian access and there is a great cafe on the front doing "fryups". 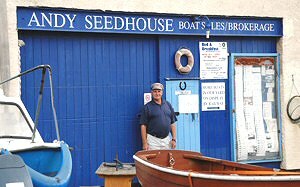 They are open from 10am - 4pm Monday - Saturday but the yards are open for pedestrians to view the boats anytime from 8am - 8pm every day so enjoy having a good look round in peace and when you spot your ideal boat go to their office or ring them on 01394 387833. All in all a day in Woodbridge is well worthwhile.